Why Did Goldman Sachs & HSBC Purchase 7.1 Tons of Gold? Home » Why Did Goldman Sachs and HSBC Just Purchase 7.1 Tons of Gold? Why Did Goldman Sachs and HSBC Just Purchase 7.1 Tons of Gold? 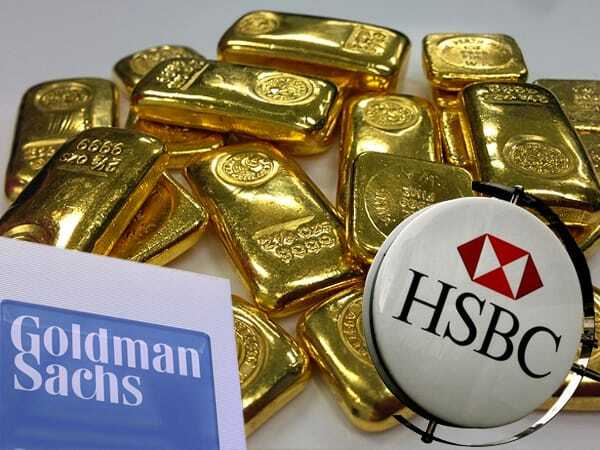 Financial giants Goldman Sachs and HSBC are the latest parties taking advantage of gold’s current price. Seeking Alpha recently revealed the shocking amount that they are stockpiling. On August 6, the two banks purchased a combined 7.1 tons of physical gold. But the number is just one of several head-spinning curiosities. Things get really interesting when one takes into account Goldman Sachs’ and HSBC’s ‘official’ outlook on gold – one that is clearly bearish. Both have been on record insisting that they hold short positions on the metal, advising clients to do the same. HSBC strategists even cited “weak gold demand from India” as one of the reasons, amid news of a 61 percent increase in Indian gold imports during the same period. So what gives? SeekingAlpha’s Avery Goodman believes that executives of both banks are gold bugs looking to play the long-term game, but that still doesn’t explain the conflicting opinions released to the public. To understand the latter, it helps to remember the accusations of foul play that Goldman Sachs was involved in during the subprime crisis. According to Senator Carl Levin, the company secretly built up a massive short position in credit default swaps while convincing customers to do the opposite. While they eventually paid a record fine of $500 million, their profits numbered in the tens of billions. Could something similar be happening here, albeit in reverse? If you, as do many others, believe that a global bond bubble burst is imminent, the scenario certainly sounds plausible. Yet another telling detail of the recent purchase was that it involved strictly physical gold – no paper whatsoever, unless you count the exorbitant sum of money used to pay for the bullion. Perhaps the purchases of 3.2 tons by Goldman Sachs 3.9 tons by HSBC have something to do with the depleting gold supply. After all, recent reports reveal that demand is expected to exceed known supplies by at least 1,350 tons in 2015. Or maybe one or both of these banks plans to set up a “Big Long” trade. With these banking conglomerates saying one thing in public but doing the opposite in private, which side do you want to be on? Be sure to check out our YouTube page for more information on precious metals here.